Power Manager 3.7 includes a new wake action. The wake action lets you schedule an event to wake your Mac from sleep. If your Mac is switched off, the wake event is quietly skipped and your Mac remains switched off. We added the wake event to improve the typical office energy schedule. An office routine generally includes regular periods of energy saving sleep for coffee breaks and lunch. Staff member reports in sick. Power Manager handles the first situation well, the Mac stays on and follows the schedule - sleeping, waking, and shutting down as desired. The second situation was less than ideal. Shutting down a Mac with an office schedule typcially led to the Mac starting itself back up after a scheduled coffee break or lunch. While this behaviour absolutely met the scheduler's aim, it jarred with the real world. By adding a wake action, Power Manager schedules can now include sleep and wake pairs, rather than sleep and start-up-or-wake pairs. A short period of sleep need no longer end with a start-up-or-wake action. This change is subtle but makes a real difference. Power-managed office Macs can now be shut down earlier than their schedule expects and they will remain turned off until the next day. The additional energy saving is noticable, and the behaviour no longer jars with real world. 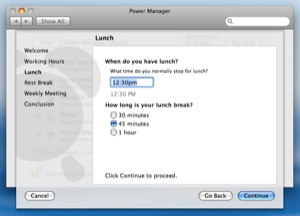 The Schedule Assistant with Power Manager contains a good office schedule. I use a tweaked edition of this schedule; I add an earlier start on Tuesdays and Fridays for my foolishly early hour exercise routine. If you use your Mac for work, I recommend giving this kind of office schedule a try. Fans of Getting Things Done will find the prompted routine particularly helpful. Power Manager 3 is available to buy and download today. This article was posted in Energy saving, and Power Manager and tagged Business, dssw, energy, environment, office, Power Manager, and save.